1. In a bowl combine apple, paneer, ginger chilli paste, salt and coriander leaves. 2. Mix wheatflour, oil and little water to make a dough. 3. Make small balls from the dough and roll them into small-medium circles. 4. Place 1 tblsp of the apple-paneer mixture in the middle and roll it. 5. Bake in an oven or a microwave for 5 minutes or till light golden brown on top. 6. Serve warm with green chutney. Tip: Preheat the oven to 180C. 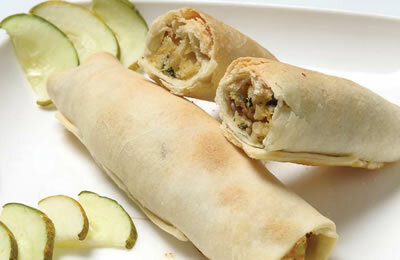 Feel free to comment or share your thoughts on this Apple Paneer Roll Recipe from Awesome Cuisine.